Christmas Dress Day/or Ugly Christmas Sweater – NO FEE Students are allowed to dress in Christmas colors/attire for no fee as a Christmas gift from our Administration Team. Elementary Roar Assembly 8:30am in the gymnasium. 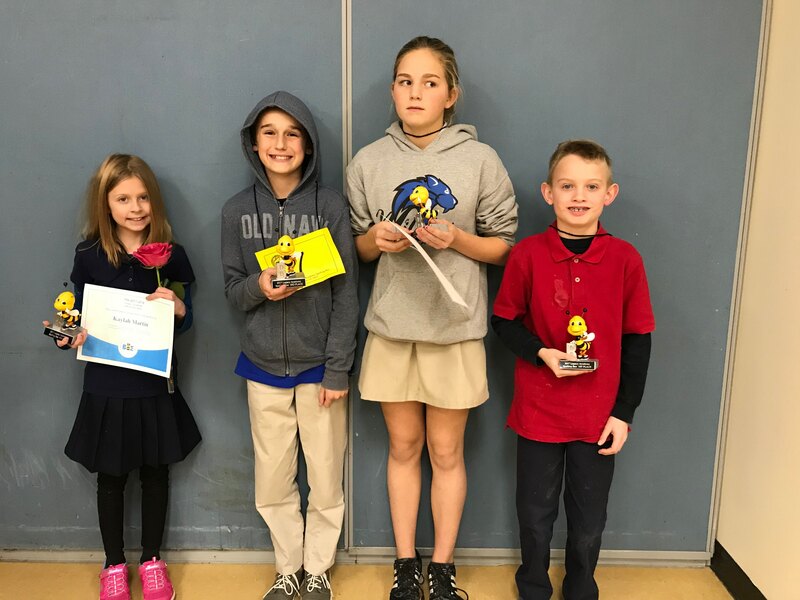 The Spelling Bee was last week and we wanted to congratulate all of the students who participated in the bee. We are now in the Holiday Season. We hope that Everyone has a Happy, Healthy Holiday Season. The PTCO would like to spread some cheer to the Legacy Academy Staff as well. Since we have been receiving such wonderful responses by using sign-up genius we decided to try it to collect donations for the Holiday Gift Fund instead of making requests during carpool. Please go to the Link for more details and to sign up for any of the Volunteer Opportunities that are currently available. Attention all fathers and father-figures of Legacy students, on January 11th from 7:15 – 7:45 am we will have ‘Donuts for Dad’ Event at our school. If you can’ t come that day, we will have ‘Hotdogs with Dad” on January 25th 2:45 to 3:45 pm. We will have information about our WATCH D.O.G.S.® (Dads Of Great Students) Program and you’ll have the opportunity to sign up! WATCH D.O.G.S.® is an innovative program being used by schools across America which helps them to be positively impacted by the committed involvement of fathers and father-figures in their student’s life. The goal is to have you spend at least one day this year at the school to be a positive male role model and provide an extra set of eyes and ears. ‘Dads, granddads, uncles, step-dads and adult brothers . . . this is your chance to have some special time with your student in a fun atmosphere at the school. Interested in signing up to be a Watch D.O.G. now? Email watchdogs@legacyk8.org. The PTCO’s General Meeting for December has been canceled due to the officers scheduling conflicts. We apologize for any inconvenience. We look forward to seeing everyone after the break. All School Dress of Choice. Fourth grade Market Day 1:00pm – 3:00pm This is an opportunity for fourth graders to practice entrepreneurship. Students will have business stations and sell their products. Please send your child to school with a dollar or two. They will have an opportunity to purchase various, kid-friendly products. The 2017 Legacy Academy Spelling Bee will be held this Thursday, December 14, at 3:45pm in the cafeteria. Please plan on attending and cheering on some of Legacy’s best spellers. The last spelling bee practice will be held tomorrow, December 12, from 3:30-4 in the STEM room. 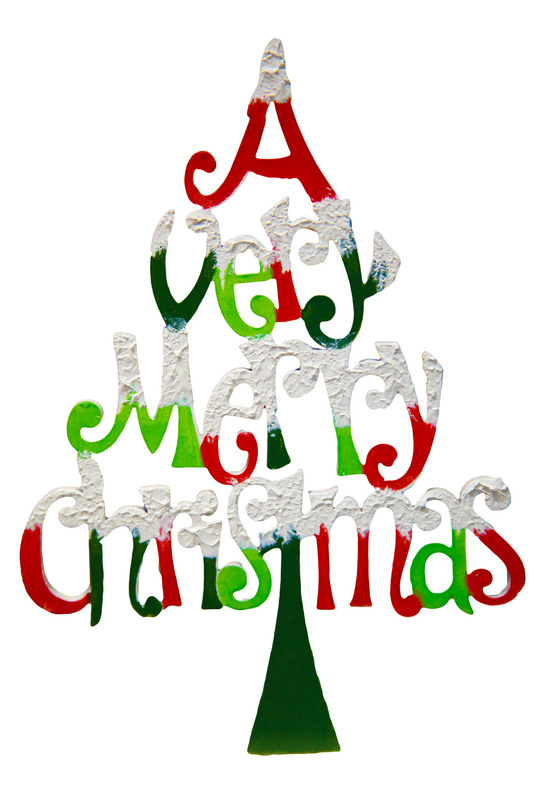 We hope everyone has a wonderful Christmas break! Merry Christmas and Happy New Year! We are all looking forward to the second half of our school year. Your children are the best part of our day. 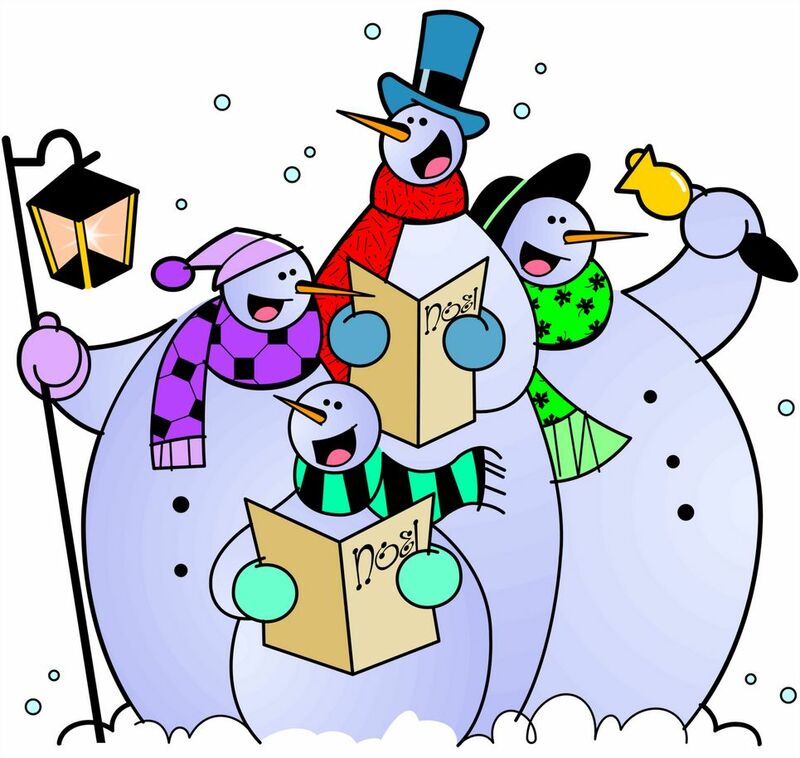 In honor of the holidays, please know that our administration, faculty, and staff might not respond to e-mails from Friday, December 21, 2017, through Sunday, January 7, 2018. Thank you for your understanding. You can also buy tickets to attend the dinner! They are available for a donation of $15 or more per ticket and ticket will be made available during carpool, at the office, or from any 8th grader selling them. Babysitting is even available that evening so perhaps this could be a date night! 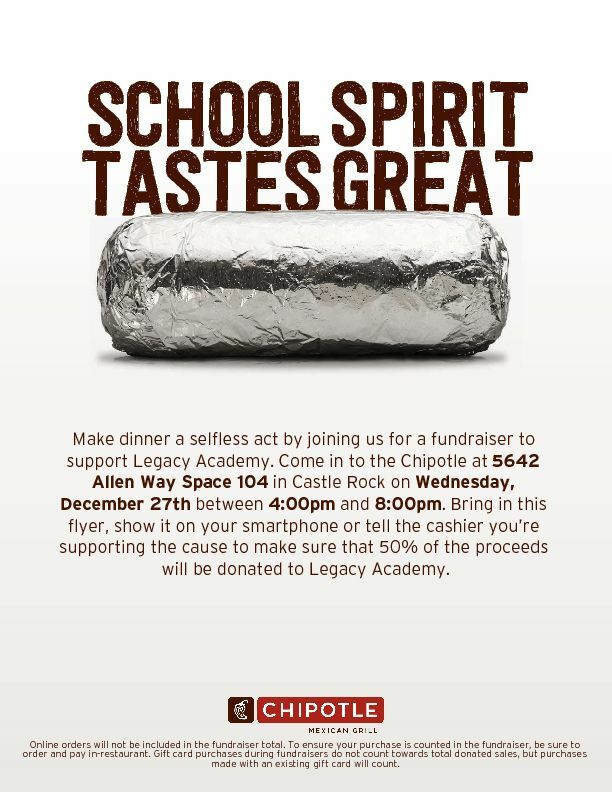 Chipotle Fundraising Event-Make dinner a selfless act by joining us for a fundraiser to support Legacy Academy. Come into the Chipotle at 5642 Allen Way Space 104 in Castle Rock on Wednesday, December 27th between 4:00pm and 8:00pm. Bring in this Chipotle flyer, show it on your smartphone or tell the cashier you’re supporting the cause to make sure that 50% of the proceeds will be donated to Legacy Academy. Attention all fathers and father-figures of Legacy students, on January 11th from 7:15 – 7:45 am we will have ‘Donuts for Dad’ Event at our school. If you can’ t come that day, we will have ‘Hotdogs with Dad” on January 25th 2:45 to 3:45 pm. We will have information about our WATCH D.O.G.S.® (Dads Of Great Students) Program and you’ll have the opportunity to sign up! WATCH D.O.G.S.® is an innovative program being used by schools across America which helps them to be positively impacted by the committed involvement of fathers and father-figures in their student’s life. The goal is to have you spend at least one day this year at the school to be a positive male role model and provide an extra set of eyes and ears. ‘Dads, granddads, uncles, step-dads and adult brothers . . . this is your chance to have some special time with your student in a fun atmosphere at the school. Interested in signing up to be a Watch D.O.G. now? Email watchdogs@legacyk8.org. Please RSVP by January 8th. Mark your calendars now for parent/teacher conferences and registration on Thursday, February 15, 2018 4:00pm – 8:00pm and Friday, February 16, 2018 8:00am – 12:00pm. Advertising: Do you have a corner lot or a highly visible location where you would be willing to advertise our school with a yard sign? We are looking for people who will place a sign in their yard in exchange for volunteer time. Please e-mail information at legacyk8.org or call the office if you can help! Thank you. Plumbing: We need a water line for an ice/water dispenser on a refrigerator. Electrical: We need to install an outlet for an LED display in the office conference room, and we need some additional recessed lights installed in the computer lab. Courtesy is being kind and polite to others; showing respect and consideration to others. PTCO General Meeting at 5:30pm (Free Childcare Provided). Come see the Kindergarten classrooms, meet our teachers, and connect with other Kindergarten families. If you have a kindergartner who may be enrolled at Legacy in 2018/19 please plan to attend. If you have a friend or family member interested in our school, please extend an invitation to join us for this all school tour. Please join us for the Christmas Concerts this week. Please make sure your student wears festive colors. Call Time is 5:15 pm. The students will report to their homeroom. The program will start at 6:00 pm and should last for approximately one hour. Call Time is 5:15 pm. The students will report to their classrooms. The program will start at 6:00 pm and should last for approximately one hour.